Seek professional assistance. 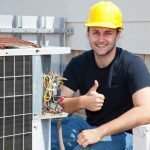 Professional HVAC technicians are a wonderful resource when it comes to furnace replacements. Experienced HVAC technicians often can tell you off the top of their heads which furnaces would be best for your space, making them an invaluable resource. Know your limits. Your home will not stay comfortable if you choose the wrong furnace; it’s as simple as that. You need to know what space the furnace will be contained in, the square footage of your home, and most importantly, how much you’re willing to spend on your furnace replacement. Do your research. A furnace replacement can be a costly expenditure, but a little research can make the cost manageable. Can you save up for a furnace replacement? What rebates or tax breaks are available to you for the installation of an efficient furnace? Will the savings on your utility bills be significant enough to even out the cost of a highly efficiency model? All these things can be helpful tools in making the best decision for your furnace replacement. If you would like to know more about the furnace replacement process, we want to help. Contact our HVAC team at Cool Comfort Heating & Air for the best tips on furnace replacement today.